TaxAssist Accountants is championing a Buy Local campaign aimed at encouraging consumers and local businesses to come together and support each other. Research reveals that for every £10 spent with a local independent business means up to an additional £50 finds its way back into the local economy. This is because the local business owners you are spending your money with will, in turn, put that money back into the local community by using local suppliers and employing people which all helps to keep the local economy thriving. Where employment is concerned, small local businesses are collectively the nation’s largest employer and provide jobs within thousands of local communities. Karl Sandall, Group Chief Executive at TaxAssist Accountants, said: “The past few years have been a particularly challenging time for many small businesses, therefore it is important for local people and businesses to support one another by taking advantage of the great services we have on our doorstep. 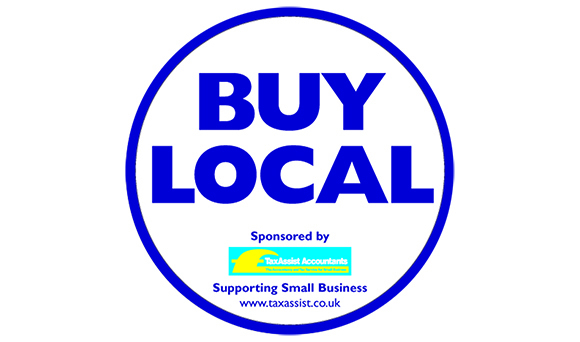 To further highlight the ‘Buy Local’ message and create awareness among the public, TaxAssist Accountants is also supplying small businesses that have visible premises with window stickers to encourage the public to shop locally with independent businesses as opposed to chains. “The owners of small businesses we have spoken to are really pleased to back this campaign by placing the stickers in their shop or office windows which is very encouraging,” added Karl. If you wish to support this initiative, then please share your views using the hashtag #BuyLocal on social media and support your local independent businesses and keep our communities thriving.